Consort will soon begin the process of wiping the database of the development-wide fob entry system. All residents/fob holders will receive notification direct from Consort to your post-box to advise of the days your building is being reset thus requiring you to visit the concierge to have your fob re-programmed. The reset renders your fob useless until you pay that visit to the concierge where you will need to present your fob PLUS the forms you also received in your post-box, properly completed. The process will begin with Collins Tower next Monday & Tuesday, then make it’s way around the square. Check your post-box regularly for your block’s dates: You should get approximately one week’s notice. A little bit of a nuisance I know, but it should be a quick and painless procedure (completed by the end of the month) and will help tighten security for us all. A reminder that Dalston Futures’ community organising master-class is tomorrow night at the Trinity Centre, and to pass on THIS LINK to catch up on their latest news. The DSRA had 2 big meetings last week and I have reports from each to share with you. Firstly, our Buildings & Maintenance sub-committee had their regular inspection tour and meeting with Consort and Barratt. In brief, progress continues in many areas including news that the replacement canopy for Blues Street will be fitted soon. We also again received a commitment from Barratt that the matters of flooding beneath phase 3 and cooking smells in phase 1 will not be put to bed until permanent solutions have been found. With regard the cooking smells issue, the local council are to be approached by Consort to confirm that all building regs with regard air extraction are being met. Ben Collins’ full meeting report can be downloaded and viewed, as always, from the DSRA-specific section of our forum HERE. The only other thing to mention is the subject of the lifts problem in Thomas Tower. For at least the past year residents of Thomas/Burke have had continual lift outages. OTIS, the suppliers/maintainers of these lifts are now claiming that some very expensive belts need replacing at a cost (because warranties have now expired) of over £9000.00! Consort, armed with resident testimony, are arguing that this issue has been ongoing since before the warranties expired and should therefore be rectified free of charge (the belts in discussion should last for 10 years or more and so should not need replacement after just 2 years). Hopefully OTIS will come around and get this sorted out sooner rather than later. We have been in discussion with Consort over recent weeks regarding the 2014/15 Service Charge estimates. We now feel that we have had the opportunity to challenge Consort on these points, and we are more confident that the proposed estimates are accurate. The proposal to contract out the cleaning has been withdrawn and a number of other changes have been made resulting in small savings. We have been given evidence allowing us to compare our Service Charges with other similar properties. We now have proposed estimates for Dalston Square across the phases of the development, which suggest that we are all now being charged the correct, roughly similar, amounts in comparison to each other, based on the charge per square foot. Unfortunately the large increases in Service Charges in phase two and three seem inevitable as phase two and three charges were significantly underestimated in the first place. The evidence of past inefficient management of our finances by Consort, particularly the failure to set a realistically increased budget last year, will make this a very difficult year. We have seen evidence that financial management has improved recently but we believe, and asked, that there should be no increase to our service charge this year. Ground rent demands have been sent and we have been told the new Service Charge demands will be sent in the next few weeks. When you receive your Service Charge, we urge you to make your concerns known to Consort. Individual personal responses have the greatest impact, and please use the Forum to share these concerns. One thing I wish to reiterate is that, although phases 2 and 3 will see potentially large increases in their service charge bills when they are sent out in the next couple of weeks (phase 3 will see the largest increases), these charges are correct for a development like ours, with our amenities, in London (around £2.50 per square foot of apartment space). Yes, there have been problems with the way Consort was apportioning costs (mostly now sorted), but the biggest problem has been the way Barratt, and by extension Consort as their agents, have been underestimating and under-billing service charges for the first couple of years of each phases life. Accusations have been made (although denied) that this was a ploy to make selling the brand new flats easier. How can it be that phase 3 was so drastically underestimated when the cost of running the 4/5 year old phase 1 was already known, unless it was done deliberately? 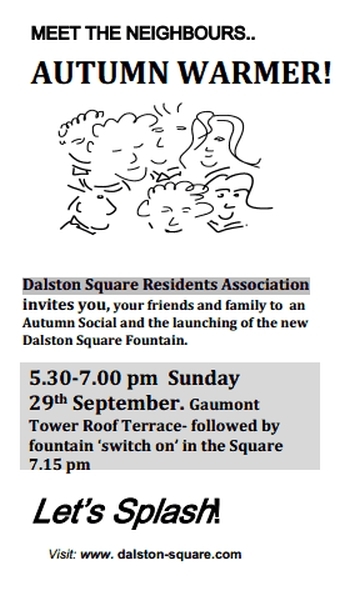 What’s happening with the Dalston Square Residents Association? The DSRA committees have been active on your behalf. We know that the first years of a new development are the time to get things right. There have been many strange accounting procedures and building glitches which we have pursued. The following are brief reports from the two committees that have been active over the summer. Ever since the first blocks were occupied, residents have been unhappy about the way in which Consort calculates and presents its budget. There have been a string of errors followed by increasing costs. Whether you pay for these via your rent, or directly via your service charges to Consort, these costs are passed on and there have been some inexplicable and rapid rises for some buildings. The DSRA has this year called for Consort to publish its budget and explain it to our finance committee. We have been dismayed that, despite several meetings, the management company has still not sorted out its common electricity costs. Some buildings appear to have electricity costs running up to ten times more than others with no explanation given. As this report goes to press the DSRA has just met again with the Consort regional manager to insist the issue be sorted out. Progress on getting the many construction glitches around the Square sorted out is more positive in as much as Barratt appear to be taking our request seriously, and in the last few months have been pushing hard for the Square’s high standards to be maintained. Trees have been replanted and watered, broken bricks, gutters, and paving slabs replaced, and planters looked after. Some improvement to bike storage has been agreed, although there appears to be a limit to what is possible. The sheeting on the canopy over Blue Street (the passageway between the library and Gaumont Tower) will be replaced soon. We have also worked to ensure street and gutter cleaning is maintained by Barratt, while awaiting full hand-over to Hackney Council. The Council is currently only cleaning the area at the top end of the Square, by the library. As far as we know, two new eating establishments are expected to occupy ground floor retail spaces in the Phase 1 buildings on the east of the Square. Kitchen air extraction will need attention: Those living in Gaumont Tower are currently getting a fair dose of smell coming into their lobby and lift shafts and the current fan system is not adequate. We have pressed Barratt for a review of the system. Another issue brought to Barratt’s attention is the lack of both windows and ventilation in the office of Consort Site Manager Sean Stone: They have promised a window and ventilator. We will continue to chase them on both of these issues. Door security remains a worry, with occasional tampering causing the lock systems to be damaged. We have insisted on daily checks to ensure security is maintained and ask that residents report any questionable locking or damage to any front door, to the concierge in Gaumont Tower, as soon as possible. Things are a-stirring with plans to make the land currently occupied by the Eastern Curve Garden into a thoroughfare as set out in the Dalston Area Action Plan. The DSRA met with the developer and architect some weeks back and impressed upon them that the loss of this much-loved community space and garden would be resisted by local residents. Since then, expressions of concern to Councillors have been flowing in, but it is important, if you feel the garden should be kept into the future, for you too to contact the council to express your support of the garden: There is currently no guarantee it will be there in a year’s time. House of Amau summer weekend – Saturday 28 September, 11am – 8pm, including steel drum workshop 3pm – 4.30pm. Sunday 29 September, 11am – 7pm, including African drumming workshop 3pm – 4.30pm. Look out for stalls selling a wide variety of books, including works by the African Caribbean Writers Group. If you want to get involved (and we need resident volunteers) in helping to plan next summer’s Dalston Square events, contact Lucy McMenemy via the Dalston Square dedicated page of the Hackney Council website HERE. This link is also in our link-list in the right-hand column of our website’s homepage, and will keep you abreast of all council-planned events that are coming to the Square. Hello again. Firstly, thanks to those who left us feedback after the last post. You will notice that the first comment was from Lucy McMenemy, Cultural Programme Officer for Hackney Coucil, so you know your voices will been heard. Surely there must be others with an opinion? This post, as referenced by the title, will give reports from 3 of our sub-committees: ASB, Buildings & Maintenance, and Finance. ASB – Chris Rivinus has produced a comprehensive document, available for download from the DSRA-specific section of the forum HERE, which contains a review of the last 4 to 5 months of this groups activities, including a summary of progress against the ASB action plan established early this year, and a note from Sean Stone in response to the ASB/Security survey conducted some weeks ago now (results from this survey are also available for download in the same forum post). ‘The finance committee is continuing to work with Consort on the 13/14 budget, we had pre-meet with Consort on 6th June to discuss progress against outstanding actions, they were able to provide some clarification on a few items but unfortunately the 2013/14 budget is still not finalised. Consort have promised to update us on Friday 14th June with a date when this will be available for the committee to review, we will then arrange a finance committee meeting to clarify and challenge this. This will then be followed by a full residents meeting where Consort can present this budget to all residents. As soon as we have a draft budget we will arrange for this to be put up on the website. The only thing to add to Dave’s message is that contact was made on Friday as promised, and Consort have now promised to supply us with all budget info for 2013/14 before June 28th. Progress is slow, but we are getting there. One last thing before I finish off, a new alert from Consort regarding cleaning of communal area carpeting throughout the Square in the Consort ‘Memos & Updates’ section of the forum HERE. I believe that is it for now, but will of course keep you all up to date with progress on these and all other Dalston Square related issues as I become aware of them. Have a good week all.